This railroad was the Chicago & Milwaukee, which in 1866 became part of the Chicago & North Western. 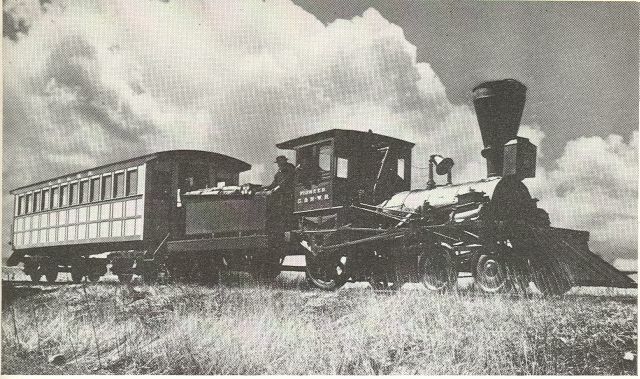 That first locomotive probably looked much like the Pioneer, pictured below. The Pioneer was the first locomotive to run on the Chicago & North Western's predecessor, the Galena & Chicago Union Railroad. In the early days, there was only one "accommodation train" run per day in each direction between Evanston and Chicago. There were no streetlights, so commuters brought oil lamps and left them at the station in the morning so they could see their way home at night. "The largest string of lanterns was outside the Davis Street station in Evanston. And a stranger, who inquired about them, discovered that they belonged not to the railroad personnel but to commuters, men who had taken the early morning trains to Chicago. So you can see the picture. Father, late as usual, looks up at the cuckoo clock as he scalds his throat with a last quick cup of coffee. In the still, empty air he can hear the engine whistle blowing for Elser's Crossing up there on the other side of Grosse Point. He wipes his moustache, gives Mamma a peck on the cheek, picks up his lantern, and starts his trek through the black forest to the North Western station. "After the Waukegan train had run about a year, the directors of the road met and passed a resolution to take off the accommodation, as it did not pay. 'That will never do,' Superintendent Johnson instantly remarked when he heard of the resolution. 'Charley, you have had a great deal of experience in carrying commutation passengers in Boston; come with me and we'll see what we can do in this matter.' We went before the directors and strongly urged them not only to continue the train, but to adopt a more liberal policy toward their patrons in the way of generous concessions in fares and a well regulated time-table. The directors asked me many questions about suburban traffic in Boston, and I stated what I knew of its rise and steady development. "In my early days on the Waukegan road, I had an engineer who was as devoted to his bottle as to his engine. It was in 1855, and we were taking out three cars full of children, bound for Evanston where they were to have a picnic. The engineer was intoxicated, but none of us knew it at the time. 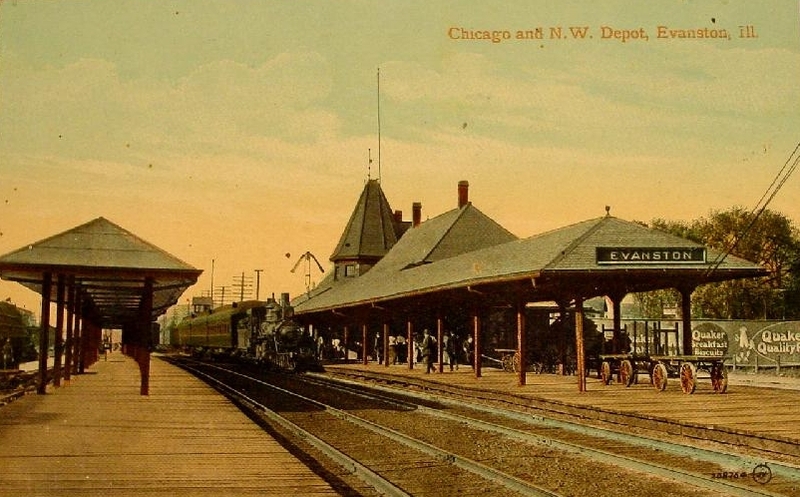 When he reached Evanston, instead of stopping, he ran straight by the station at a high speed. We stopped the train with the brakes as soon as we could, the engineer claiming that something was wrong about the throttle, so that he could not shut off steam. Fortunately we stopped just in time, for another train was already in sight. I asked the fellow what in the world he was thinking about to do such a foolhardy thing as that. 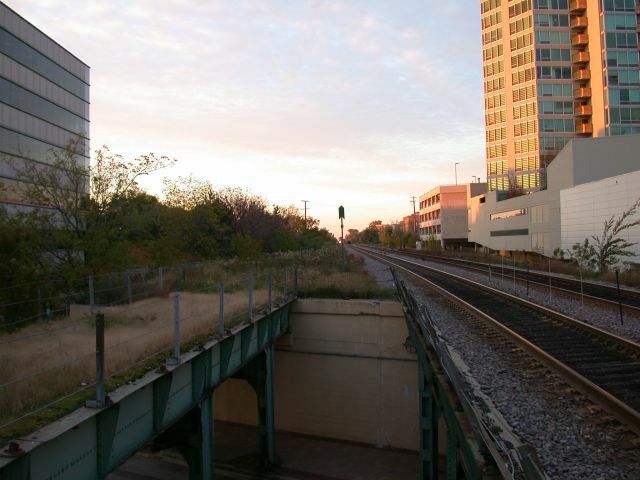 At its peak, the C&NW main line through Evanston consisted of three tracks, with the center track being a reversible "express" track used by inbound trains in the morning and outbound trains in the evening. Originaly, the three tracks merged into two about 1/4 mile south of the Wilmette station at a location called Wilmette Tower. As time went on, more and more of this "extra" track became superfluous and was removed in stages, with the former center track becoming the outbound track. For example, by 1957 the location where the three mainline tracks merged down to two was moved south to Canal Junction and Wilmette Tower was closed. This track removal is why Evanston now has several viaducts where weeds have replaced rails and ties. As time went on, several of the stations were reconfigured. In some cases, passenger platforms were cut back (such as the one that used to extend south over Davis Street). In other cases, new platforms were constructed directly on top of where the third track used to be. 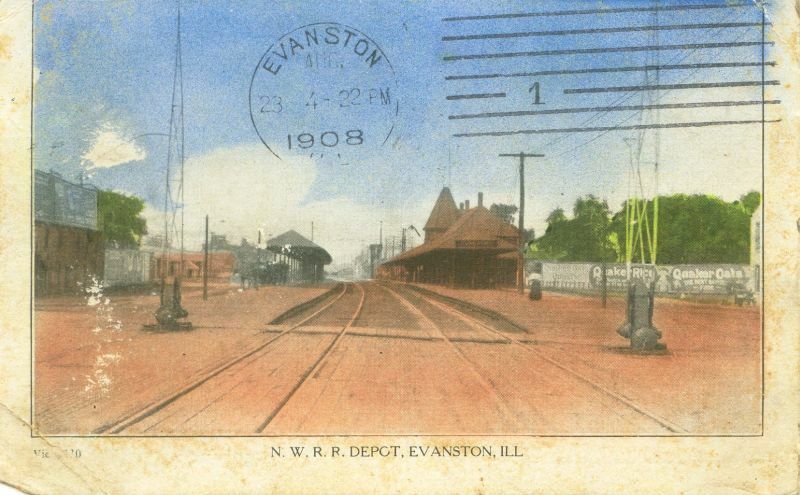 The C&NW's commuter trains made several stops on the main line in Evanston, at Calvary Cemetery (Mulford Street and Chicago Avenue), Main Street, Dempster Street, Davis Street, and Central Street. On December 1, 1958, the C&NW closed down 22 of its close-in sations to increase the efficiency of the commuter trains serving the expanding suburban fringe. [Grant, p. 204] The Evanston stations at Calvary Cemetery and Dempster Street were closed at this time. The C&NW continued to run commuter service to its remaining Evanston stations until the merger with the Union Pacific Railroad in 1995. Today the UP runs these commuter trains under the Metra banner.